The Tanakaya liquor shop in Mejiro, Tokyo is a treasure trove if you are living in Japan and fancy some foreign alcohol. Its single malt whisky selection, for instance, is formidable, much better than the vast majority of off licenses in the UK. Tanakaya has a great beer range, good wine, port, sherry, and loads of different spirits. It is specialising in foreign liquor, so it is not the place to go if you are after sake or shochu, but it does seem to carry limited stocks of Japanese produced foreign style alcohols. This is fortunate for the Japanese whisky fiend because the limited stock of Japanese single malt whisky currently comprises of the Ichiro's Malt range. None of the standards are here - Yoichi, Miyagikyou, Hakushu, Yamazaki, Fuji-Gotemba or Karuizawa - but when I visited they still had a few bottles of the divine Ichiro`s Malt Single Cask 2000 on the shelves (not to be confused with the somewhat less than divine but similarly labeled Ichiro`s Choice Peated Golden Promise.) Ichiro`s Malt is not cheap. Expect to pay between 7,000 yen and 14,000 yen for a bottle, but this is the only place I have found so far where you can buy this stuff on the high street. All made by Baird Beer of Shizuoka, Japan. Nice. 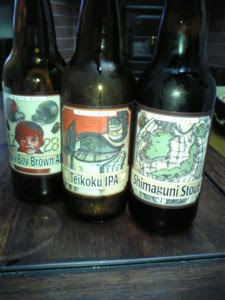 Loved the labels too: "Shimaguni" ("Island countries"), with Japan replacing England beside the Emerald Isle, and "Teikoku IPA" ("Imperial IPA"), with the Japanese Empire replacing the British as the producer of that quintessentially imperial brew India Pale Ale. Mejiro Station on the Yamanote line. There is only one exit. Turn left. Walk about 20 meters. It is in a basement on your left. Right beside McDonalds. View location on Nonjatta map of single malt stores.